I’m working with two clients through an acquisition of another organization. With the acquisition of talent and organizations, it can prove challenging when there are multiple leadership layers and no clear understanding of the value of each managerial layer, poorly understood boundaries of goal-setting and no agreement on how the organization promotes and supports people. Who, does what, when, where? How will we do the work? What work are we doing? Can we identify what is working to amplify? Can we identify what is not working to dampen? How many leadership layers are too many, not enough? When the above questions are poorly understood the organization will constrict and fail to achieve the success projected. 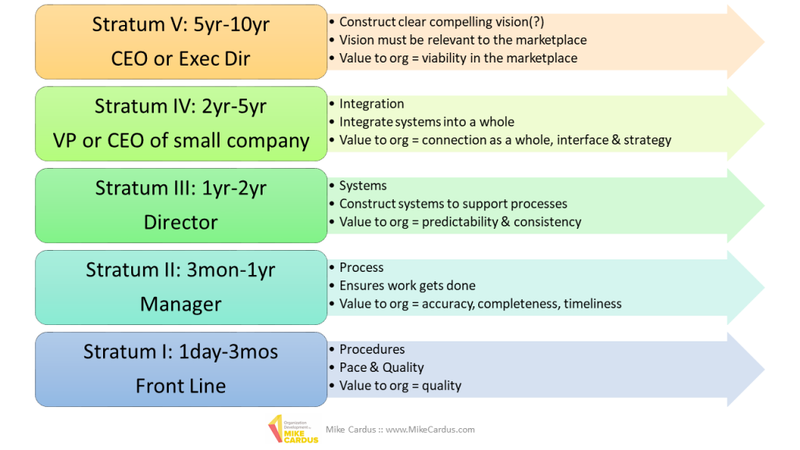 Below is a framework that I use for organization design and leadership. The frame comes from the work of Elliott Jaques Requisite Organization. Each managerial leadership layer (Jaques calls them stratum) is useful to support the work getting done and to ensure minimal macro and micromanagement. Additionally, each stratum has a discretionary time span – meaning the most extended time of a goal to be completed within that stratum. With stratum IV the time span is 2 – 5 years, saying that the longest goals that this role has to achieve will be within 2 to 5 years, they will have goals that are shorter, but none that are longer than 5 years. Each managerial leadership layer or stratum identifies the type of work expected, at that leadership stratum, how the work is completed (what success looks like) and the value that leadership stratum brings to the organization. I hope you see that no stratum is more important than another, and they need each other to support the organization to flourish into capacity. What happens when the leadership layers or stratum is weak, underdefined, or absent? When the stratum of the organization is weak this is a crack or constraint, and when you are the person doing the work, you have to dip into the stratum below and do that work. So, if you are a stratum III director developing systems to understand financial forecasting and data to support ongoing growth and acquisition, plus the stratum II layer manager does not exist, or is not doing their work – then you have to do the development of process work to ensure that the front-line work is getting done on-time, on-budget … That means that your systems development is constricted and the organization is not gaining the predictability it needs! Organization design is the skeleton of your organization. A good design supports a healthy flow of work, cash, people, and customers while a bad design constricts these.